Although most of you are quite familiar with the selfie , ( picture of ourselves ). This wasn't always the case . In fact , it wasn't until the early 2000's that everyone started talking about the idea of a selfie , taking selfies and then posting them online . My selfie , Is a picture of me and what I like to do . My hobby is drawing . I've been at it for quite a while . Possibility of becoming an artist : 8% chance . 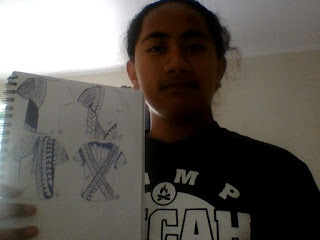 I really hope you had enjoyed your holidays at Samoa at the moment but here today I just want to see how you have been doing with your summer learning journey blog post and what an outstanding picture with you and your favorite hobby which is drawing. I as your classmate from last year think that you are a very good drawer and I think that very cool because how I am one of the people who likes to draw to mostly culture patterns. I really enjoy looking at your photo with you and your drawing.Your drawings look so cool and amazing and I think people would love to see more.